I have a freezer confession. I don’t use it very well most of the time. The ice-maker comes in handy, of course, and I couldn’t live without the freezer for the short time ice cream spends in it until it’s gone. But, when I actually store things away for a later date, I always leave them to frost over in the dark, forgotten depths. At some point, I’ll reorganize the contents only to find parts and pieces of things I thought I’d use and never did. Those quail wings intended for a stock, the extra pasta dough that I might have rolled into ravioli, and the lima beans I didn’t have time to cook last fall but was sure I’d turn into a gratin some day, were never used. I may have finally turned a corner though. During our far too short blackberry season, I popped some berries in the freezer knowing I couldn’t possibly forget those little gems. Then, when I baked those brioche pastries and used the extra dough for a brioche loaf, the bread when into the freezer. I had a vision of blackberry bread pudding happening when the time was right, and I really did it this time. There’s an Apple-Apple Bread Pudding in Baking: From My Home to Yours made with caramelized apples and apple butter. In the side-note, Dorie suggests trying the same technique with other fruits and jam. My frozen blackberries were thawed and macerated with sugar, and my brioche loaf was sliced and spread with Confituras blackberry jam for this summery bread pudding version. At a cooking class I attended a few years ago, I learned something about bread pudding that completely changed my thinking about it. In that class, the bread pudding was made with corners of the bread intentionally sticking up out of the custard. That way, lots of edges became crispy while the lower parts of the bread absorbed the custard. It was the good mix of textures that I really liked, and now I always keep that in mind in making bread pudding. Here, the brioche loaf was sliced and the pieces were slightly toasted in the oven to dry them. Each piece was cut in half and then spread with blackberry jam. 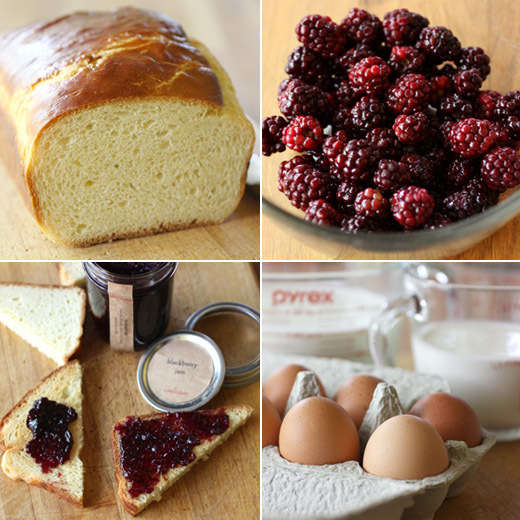 One layer of jam-coated bread slices was placed in the baking dish, and the sugar-macerated blackberries and juice were poured over the bread. The remaining bread was arranged on top, and a rich custard made with milk, cream, eggs, egg yolks, sugar, and vanilla was poured over all the bread. It was left to sit so the bread could soak in the custard for about half an hour before it was baked. For baking, the dish was placed in a roasting pan and both went into a 325 degree F oven. Boiling water was poured into the roasting pan to come half-way up the side of the baking dish, and the bread pudding baked for an hour and 25 minutes. After it cooled for a bit, the pudding was easy to cut into wedges of custard-filled bread layered with jam and fruit. I served it with bourbon whipped cream and sliced peaches, and the crunchy tops and tender lower layers were delightful. Maybe I should start leaving notes for myself about what’s been shoved into the freezer. Or, maybe I just always need a really good plan like this one for what gets stored, and then I’ll surely make good on it. Lovely looking bread pudding. We often make it with some of the bread stick up too - love how crusty it gets! And I have a similar problem with my freezer. Although I'm great at using all of the big, obvious stuff, it's those little bits that I always forget about. Anyway, fun post - thanks. Your bread pudding sounds wonderful, especially with the peaches and whipped cream. 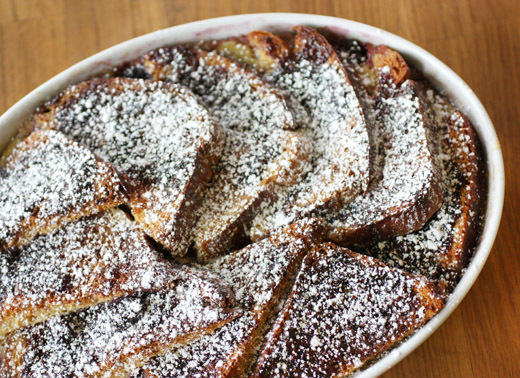 Blackberry bread pudding made with brioche sounds heavenly. Eric has taken to making me French toast with brioche and now I can never go back. I suspect you may have the same issue with this bread pudding. Once you taste a version with brioche, other breads just can't compete. I don't even use my fridge properly :) You pudding looks tasty. Bread pudding has got to be one of my favorite things and yours looks absolutely delish! Super delicioso su pudding totalmente bueno,saludos y abrazos. Great tip about leaving some tips of the bread up! I love the crunchy part! Any bread pudding is a friend of mine. The crunchy parts of bread pudding are the best parts, right? Totally right. Loved how you sliced and layered the bread. It makes for a completely different looking bread pudding. 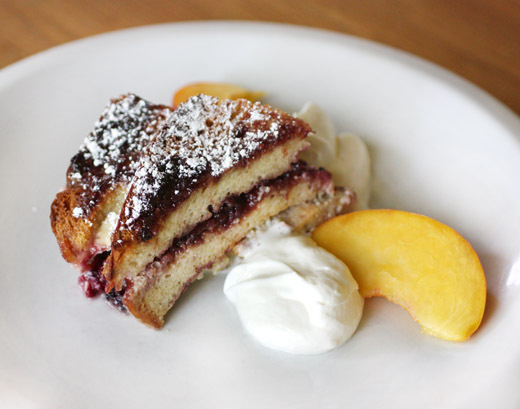 Lisa, your bread pudding looks fabulous, I love the idea of using brioche and yes lot of blackberries, fresh and jam...yum! How perfect are those berries?! What a great combo. I do not have the homemade bread but I do have blackberries sitting in the freezer. I have some babka there, in the deep freeze, and I think this bread pudding is a great idea for it - it looks so delicious!